A very special way to discover the lifestyle and traditions of the Mongols is to stay a few days with nomadic families. Accompanied by a translator, for a short while you will become a nomadic family member. Grazing the herds, riding horses and eating the local cuisine are just a small part of the whole experience. We can also make special arrangements for you to stay in a Buddhist monastery; learn more about Buddhism, understand how the lams of this Tibetan philosophy dedicate themselves to spiritual awareness, and take time to relax. Home and monastery stays can be arranged for you as stand alone trips or added to another trip of your choice. 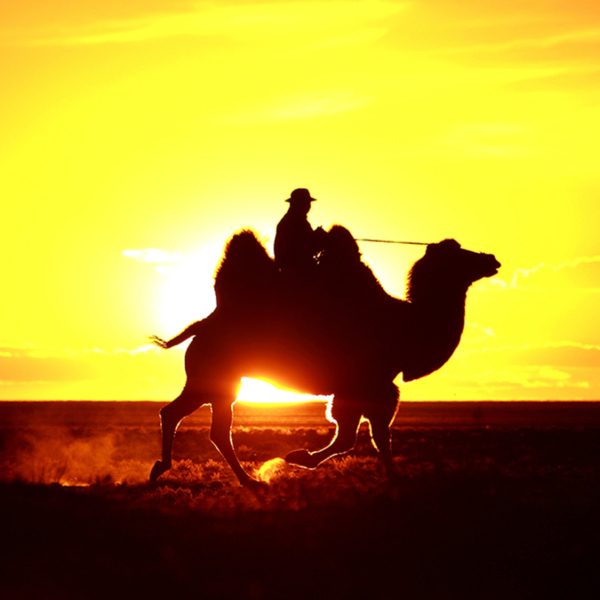 We leave the Mongolian capital as we head south to the verge of the vast Gobi Desert. Our ultimate destination of the day would be Delgeriin Choiriin Temple. The temple, originally built by Zava Damdiin Rembuchie (Rinpuche) some 150 years ago, has been completely destroyed during the 1930’s anti-religious purges conducted during the communist era. The current Zava Damdiin Rembuchie, the reincarnation of the founder of the temple has begun restructuring the temple back in 2005, in an attempt to bring the glory of Buddhism back to Mongolia after 70 years of ban on religious practices. Not only a site of spiritual greatness, the temple is located by a site of great natural beauty. Located in the Central Gobi, Baga Gazarin Chuluu (The Small Place of Stones) is a marvelous geological oddity, characterized by impressive rock formations rising from the desert steppe. As the area is quite rich with water sources, many nomadic families spend the summer here. For the coming two and a half days, we shall spend our time with the monks at the monastery, getting some insight into Buddhism and monastic life. In between the teachings, we would take the time to explore the natural marvels of Baga Gazariin Chuluu. We spend the nights at the small and simple pilgrims’ house in the monastery’s vicinity, and share our meals with the monks. Approximately six hours of driving through the Gobi’s typical cold desert landscape, so called because the Gobi receives its moisture in the form of snow, brings us to Ongiin Khiid on the bank of the Ongiin River- once the Gobi’s largest river, but today a petty stream due to the ongoing mining activities that have drained most of the desert’s water sources. Though now days’ monastery is rather small in size, the site’s name refers collectively to a cluster of monasteries, temples, and Buddhist universities that were established here in the 18th and 19th century, and served as one of the largest Buddhist sites throughout the country. The complex, housing some 1000 monks at the time, was divided into two monasteries- Barlim Khiid on the southern bank of the river, and Khutagt Monastery, on the northern side. Like most religious monuments in Mongolia, both monasteries have been destroyed during the anti-religious purges of the 1930’s, led by the communist party. It is believed that some 200 monks were executed during these purges, and the surviving monks were forcibly conscripted to the Mongolian People’s Army. In recent years, efforts made by the local communities, as well as by the religious institutions of Mongolia have resulted in the reconstruction of the main stupa, and the first temple has been inaugurated back in 2004. As we arrive in the camp, we take a hike to one of the many hills surrounding the area, for a view over the historic ruins, and the beautiful plateau. We also visit the local museum housing artifacts that were hidden by the monks during the time of the purges. Overnight in a ger camp- the cozy yet simple, Mongolian version of a lodge, consisting of traditional felt-made dwellings the nomads of Central Asia often refer to as yurt. Today we reach the Mongolian steppes. Here there is a great variety of birds of prey, including eagles and falcons, constantly on the watch for a meal. As we drive up north, the scenery would gradually change from the arid steppes typical to the desert into the fertile green grasslands of the eastern slopes of the Khangai Mountains, Mongolia’s second largest mountain range. After lunch we head into an area dominated by volcanic scenery, which takes us along the Orkhon River Valley. A UNESCO World Heritage Cultural Landscape, the valley has served as the center of several kingdoms and empires that ruled much of Central Asia for centuries. The UNESCO committee states: “Collectively the remains in the site reflect the symbiotic links between nomadic, pastoral societies and their administrative and religious centres, and the importance of the Orkhon valley in the history of central Asia.” (UNESCO website). Late in the afternoon we arrive at the camp of our host family. We will make an introduction with the family members over traditional dinner, and then set for the night in a local ger nestled by the family’s ger, which will make our home for the coming 2 nights. Today we will take an active part in the daily life of our host family, joining them as they graze their herds, milk the animals, produce dairy products and carry out any number of other day to day chores. We may arrive as the family is making felt for their ger covering, or gathering fuel for winter, or engaged in some other special project, in which case extra hands are always very welcome. We will join the family for very traditional meals, and after dinner together we again go to our ger for the night. Leaving our camp, we take an hour's drive to the beautiful volcanic canyon through which the Orkhon River flows. Here we take an easy hike along the canyon floor, and end up at the pool at the bottom of the Red Waterfall. For the brave at heart, a cool swim awaits! We hop back to our vehicle, and drive to one of Mongolia’s most impressive monasteries, where we take a three and a half hours’ hike (of which, one-hour up hill). Located at the top of a high hill with a view of seemingly endless pine forests, Tuvkhon Monastery was established during the 1650’s by Zanbazar, one of Mongolia’s most respected religious leaders. Fleeing the Manchu Emperor, the Zanbazar built a monastery in this hidden place, using a natural system of caves and adding small wooden buildings. In the afternoon we keep on driving up the river to Kharkhorin. Overnight in a ger camp. Built by Chinggis Khan about 800 years ago, Kharkhorin, better known as Karakorum, was famed throughout Asia as the capital of the Mongol Empire. Within the walls of this spectacular city kings were chosen, laws made and the fate of the next city to be conquered were determined. We will visit the ruins of the old city, the Erden Zuu monastery and other historical monuments in the area. After lunch we take the five to six hours’ drive back to Ulaanbaatar. In the evening we enjoy a farewell dinner, followed by a visit to the Zaisan Hill, for a view over the city at night. Overnight in Ulaanbaatar.